ImPerfect Dancers is staging Lady Macbeth at the Salesian Theatre, Sliema, today and tomorrow at 8pm. 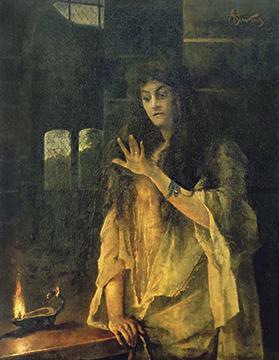 Lady Macbeth, a painting by Alfred Stevens at the Musées communaux de Verviers. The drama is inspired by Shakespeare’s timeless tragedy that focuses on the devastating and bleak love story between Macbeth and his wife. Lady Macbeth starts off where Shakespeare’s version ends: Macbeth and his wife are dead. Freed from their earthly torments, they are however condemned to endlessly relive the darkest period of their past – a punishment inflicted upon them and which they in turn inflict on each other. They blame one another, seeing the other as the real culprit. Thoughts take shape, the characters come tolife and relive the dramatic events of which they were once the protagonists. But like memories, these events change over time. What is more: their nightmare is interspersed with moments of love and tenderness. Lady Macbeth is a drama about life and death, and about the ambiguous relationships between people, taking the audience on a journey to discover the complexities of the human psyche. In 2016, Lady Macbeth was also turned into a British drama film directed by William Oldroyd, featuring Florence Pugh in the title role. Lady Macbeth will be staged by ImPerfect Dancers at the Salesian Theatre, Sliema, today and tomorrow at 8pm. For tickets, visit https://tsmalta.com/whats-on , ticketline.com.mt , or call 2133 1447.